Electricians will be protesting at the Brill Place Lab building site tomorrow and are asking for support. The UKCMRI consortium has boasted to us in the local community about how well they and Laing O’Rourke builders are running the site for the “Francis Crick” institute. Ivor Goodsite the considerate constructors scheme mascot even made an appearance at the Somers Town festival! What they didn’t tell us is that Laing O’Rourke is one of the huge building firms that are trying to break up pay and conditions agreements for their workers. Electricians in the Unite trade union had a huge battle last year and eventually forced the companies to back down. But now one of Laing’s companies called CHT has withdrawn from the Joint Industry Board national agreement, and the electricians believe Laing O’Rourke is leading the way with a new attack on its workers. This will go on for a few hours if you want to go and support them or find out what is happening. 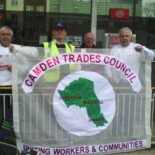 This entry was posted on August 16, 2012 by CAMDEN TRADES COUNCIL.